Here Hazrat Sultan Bahu Rahmatu-Allahe Ta-aala Alaihe has resembled the Seeker with gold and the Murshid with the goldsmith. 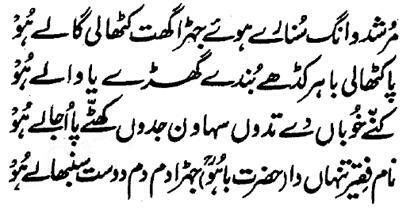 Murshid is like goldsmith and jeweler who puts the Seeker into the fire of Riyazat, Service and Test and removes the impurity in him making him pure excavated gold. Thereafter, he makes ornaments of this pure gold and presents these to the Real beloved to wear and makes the Seeker Waasil with the Beloved. Martaba of Faqar is got by those Seekers, who keep the Visualization of the Friend established in every breath and moment.